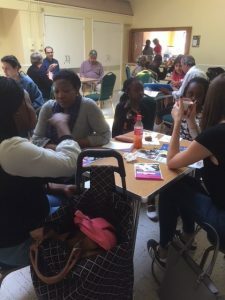 The Helping Hands FoodBank is the only food bank in Lewisham providing sustained support for refugee, asylum-seeker, and vulnerable migrant families who are struggling to feed themselves. Our FoodBank provides parcels of food and toiletries of varying sizes, depending on the size of the family they are designed to support. They typically translate to one meal a day for the whole family. Though mainly catering to families who live in Lewisham or Greenwich, we endeavour to help all referred refugees in need of support. Once registered, members are able to use the Foodbank for a period of 6 months. The Foodbank itself is run more like a community centre, with members encouraged to stay for the whole morning. We have an array of refreshments to enjoy and activities such as Sewing club and English Lessons. The FoodBank is open throughout the year on Saturday mornings, 10am-12pm. Alternatively, you can use the donate button (at the top of the screen) to help us purchase food items when we are low on stock.